With our theme you can create footer of different layout and colors In Theme Options -> Footer some predefined variants of columns structure. For example: if you set footer layout to "Three Columns" you will find 3 widget areas in Appearance -> Widgets so you can add any widgets here and will see them in 3 equal columns. The other way is to add HTML Block to the footer widget area. To do this you need to choose "Single Column" layout and add there a widget called BASEL HTML Block. 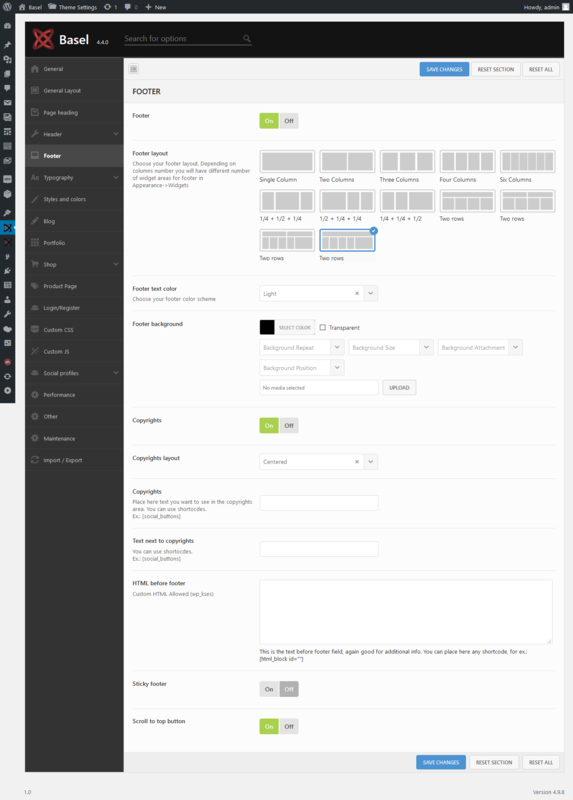 You can create this block using all the elements and layouts of WPBakery Page Builder plugin in HTML Blocks -> Add New.